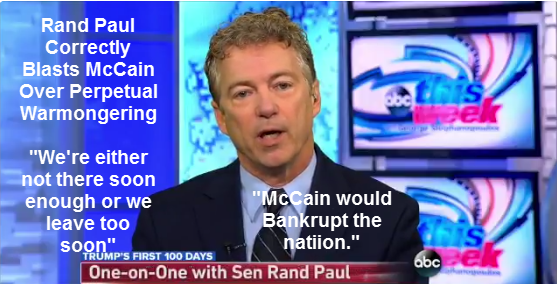 Rand Paul Blasts McCain Over Perpetual War: "He Would Bankrupt The Nation"
Senator Rand Paul blasted fellow Republican Senator John McCain over McCain’s perpetual warmongering on ABC’s “This Week”. Some are undoubtedly disheartened by political infighting, but this infighting is good. These are debates the country desperately needs to have. Sen. Rand Paul (Ky.) ripped fellow Republican Sen. John McCain (Ariz.) on Sunday after McCain criticized President Trump’s escalating war of words with the media. He argued that the nation is “very lucky” that Trump is president and not McCain, who won the 2008 GOP nomination but lost to Barack Obama in the general election. Paul said that McCain’s recent criticisms of Trump are driven by his “personal dispute” with the president over foreign policy. He added that McCain and Trump are at odds because McCain supports the wide deployment of U.S. troops to protect and promote American interests abroad while he characterized Trump’s views as closer to a realpolitik approach to foreign policy. “He would bankrupt the nation. We’re very lucky John McCain’s not in charge, because I think we’d be in perpetual war,” Paul added. Paul argued that McCain has a history of being wrong major foreign policy questions. “I would say John McCain’s been wrong on just about everything over the last four decades. He advocated for the Iraq War, which I think destabilized the Middle East,” he said. “If you look at the map, there’s probably at least six different countries where John McCain has advocated for us having boots on the ground,” he added. Finally, someone in the party is standing up to McCain’s perpetual warmongering! I am totally sick of fake-patriot, warmonger as*holes like senators John McCain, Tom Cotton, and Lindsey Graham. Hats off to Rand Paul. The sooner this county rids itself of fake patriots like McCain, the better off the US will be and the safer the world will be.